This free sample includes the dates of Feb. 4th-8th, 2018. 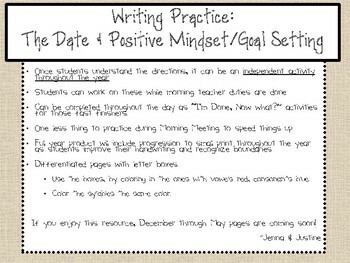 Teach your class to get into the habit of starting the day with a positive mindset, and get into the habit of goal setting. •Start the year with the boxes, let them progress to the lines. •Copy 2 sided and let them choose which side to do. 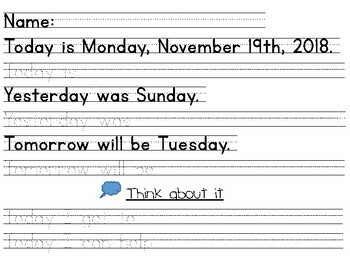 •Can be completed throughout the day as an “I’m Done, Now what?” activity for those fast finishers. •Checklist to make sure they didn’t forget anything. •Differentiated pages with letter boxes. 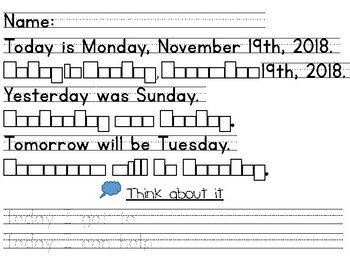 •Use the boxes, by coloring in the ones with vowels red, consonants blue. •Color the syllables the same color. If you enjoy this free resource, the growing bundle of December through May daily pages will be coming soon!